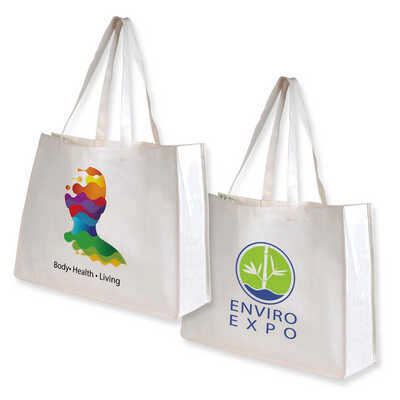 Giant double handle non-woven bamboo carry bag with large gussets. Made from bamboo, one of the world`s fastest growing plants. Ideal for environmental projects as bamboo is a renewable resource and biodegradable. Join the revolution to reduce the use of plastic shopping bags! Colours - Natural Size - Bag: 500 x 400mm (LxH), Gusset: 160mmD, Handles: 640mmL. Decoration Area(s) - Screen Print : Front/Back - 320 x 290mm (LxH); Nucolour 4CP Digital Transfer : Front/Black - 210 x 297mm (LxH); RGB Direct to Garment Print : Front/Back - 290 x 290mm (LxH), Submit design for acceptance & price. Price includes : 1 Col 1 Pos Print. Setup is included.